The twelve sonatas are therefore typical of their period, influences and place: They are short - the longest is just over eight minutes - and have at least three sections in contrasting tempi. In fact there are often five sections and sometimes more. Dance rhythms play a strong part in the faster pieces. An older style polyphony switches easily with a more searching harmonic palette. The parts range from two - that is a bass line with continuo and melody over - to a five-part texture. The instruments employed by the twelve members of Musica Fiata include a chitarrone, bass viol, dulcian, which is a bassoon and features prominently in the quite arresting Sonata VIII. There are also violins and ‘Zinken’ - a German cornetto. The booklet also lists Posaunen, which are early trombones. As you move through the CD the instrumentation varies pleasingly. This does mean that unless you want to hear the sonatas in numerical order you will find that the instrumentation holds your interest. I have listed the sonatas above in the order in which they appear. The performances are sensitive, lyrical and clearly balanced, ornamentation where used, is beautifully in keeping. Rosenmüller was forced to leave his employment in Leipzig due to an accusation of pederasty and flew to Venice. This proved a bonus for German instrumental music because he was able to earn a living as a trombonist in St. Mark’s Venice. What he must have played and heard in the 1650s and 1660s is mind-boggling. Schütz would have been around as would Cavalli (d.1676), and the opera composer Antonio Cesti (d.1669). There was an increasing interest in opera and theatre. Giovanni Legrenzi (d.1690) had also been prolifically writing sonatas and seems to have had some influence on Rosenmüller. Incidentally there is a disc which enables you to contrast sonatas by Rosenmüller, Legrenzi and Stradella. This is worth seeking out. It’s by The Rare Fruits Council under Manfredo Kraemer (Ambronay AMY028) which I reviewed in 2011. 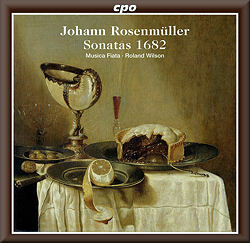 Rosenmüller also composed many, rather vivid, Latin-sacred works for voices and instruments. These are in an Italian style which would have suited Venetian taste. Not surprisingly therefore Rosenmüller’s sonatas sometimes inhabit a sense of the dramatic with weird chromatic passages. There are daring modulations as for example in Sonata I with its lovely cornetto part as well as sudden tempo changes. These are always imbued with a sense of Germanic logic. Quite rightly the booklet essay highlights four of the more interesting sonatas. I will draw some of them to your attention now to enable you to gain a deeper view of the music. The Sonata II in two parts consists of slow movements with short Allegro passages scattered about its eight minutes. The final Largo is especially ‘sumptuous’ (Hillebrand) The Sonata VII has a chromatically rising figure which obviously brings Bach to mind. At the end it fades away like sighs at the end of a love-lorn aria. Sonata I and Sonata IV are highlighted in the booklet but I would instead draw to your attention Sonata VI for strings. It is in three parts. The first begins with a wild presto full of virtuoso scales. This but quickly subsides into a cadence point before a slow, rather lugubrious chromatic fugal section begins. An Adagio of about four bars leads into a gentle, imitative, compound time polyphonic section. This becomes rather free before another expressive Adagio takes hold, but only briefly as a repeat of the opening (almost) bursts in to end the sonata amid excitement. This bears a strong resemblance to the pattern of Legrenzi’s sonatas. The final track is the joyous Sonata X in five parts with cornetto to the fore. Here Heinrich Biber (d.1704) came to mind especially in its more solemn moments but also in its fanfare figures. This disc is from a somewhat specialist area but it’s wonderfully played and will give much pleasure especially to lovers of the early baroque.